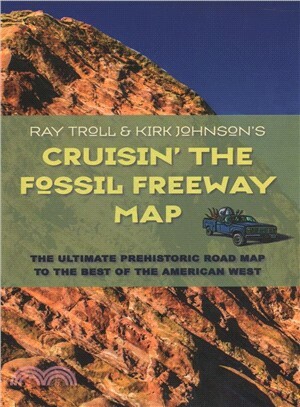 An illustrated companion map for Cruisin' the Fossil Freeway, which follows the zany travels of a paleontologist and an artist as they drive across the American West in search of fossils. Kirk Johnson is the Sant Director of the Smithsonian's National Museum of Natural History. He received his PhD in geology and paleobotany from Yale University in 1989, and did postdoctoral research in the rainforests of northern Australia before joining the Denver Museum of Natural History in 1991, where he directed the installation of the museum's Prehistoric Journey exhibit. Johnson also hosts the three-part NOVA series Making North America, airing on PBS networks in November 2015. Johnson is the author of many books, including Ancient Denvers, Cruisin' the Fossil Freeway, and Prehistoric Journey. His research focuses on fossil plants, the environmental effects of the dinosaur-smiting asteroid, and the birth and death of biomes. Johnson lives in Washington, DC. Will Clyde is a Professor of Geology in the Department of Earth Sciences at the University of New Hampshire. His teaching and research focuses on paleontology and Earth history. In particular, he is interested in understanding the relationship between climate change and mammalian evolution during the Paleogene period of Earth history. Clyde lives in Durham, New Hampshire, with his wife and two children. Ray Troll is an artist who has illustrated ten books, including Cruisin' the Fossil Freeway, Sharkabet, Rapture of the Deep, and Planet Ocean. He and his wife, Michelle, own and operate the Soho Coho Gallery in Ketchikan, Alaska.